Fernando, the desk clerk was very friendly and polite when checking us in. The beds were comfortable. I have no complaints about the size of the bedroom or living room. While overall, the space was smaller than I prefer, it was manageable. The location is very good eventhough it far from a center around 30 minute. Bus, tram are very close. The metro is around 800 m. There are supermarkets near the hotel. The kitchen stuffs are very good. When i read the reviews from other people who stayed here, i really wanted to change hotels. But from experience it was a lovely place. We didnt go to Paris to stay at the hotel anyway. It got everything we need, the room has enough space for all 6 of us, the kitchen was complete. The bathrooms and toilets were a bit small but its acceptable. I didn’t like anything it was the worst hotel I’ve ever been in my life. No cleaning for the room except if the guest stay 8 nights and the cleaning will be only one time a week. The room size is very small and the size of the rest room is miserable only 1 meter. The air condition broken then they didn’t fix it so we stayed in a really bad place, outside was very hot and when we stay at the room we couldn’t sleep and I have kids so we suffered a lot, even we paid too much. We don’t like to go to Europe again because of this bad experience. The only one thing I respect was some of the staff who was trying to help me espicially Hafeetha,Maryam,Boemi and from the restaurant mr Ahmad. I don’t like anything with it I don’t know if it’s a real hotel, I paid money with high rate then I’ve shocked that there wouldn’t be a cleaning service unless if I had booking with 8 nights even I got 9 nights but separated (5+4) but they refused to clean unless if I pay for each cleaning (25€),does it make sense, the other big problem was the air condition, when I came there was no air condition so I asked them why it didn’t worked then they answered that they have a problem and they would fix it but until today(6 days since I’ve arrived) the same problem(air condition damaged) even I have family(kids one of them is 4 years old) If I have the right to rate it maybe I’ll rate it with 1 star not 4. I lost my money with no service no value, either human and animals unable to stay with this situation (no air condition and no cleaning. It’s close to tram and walking distance to metro stations. Quiet neighborhood. The staff is professional and speak English very well. They are very responsive to any requirements we asked for. The apartment is suitable for families with a large number up to 6 guests with beautiful view balcony and kitchen equipped with all you need to cook + washing machine. The hotel is situated in a good area where you have access to all kinds of public transportation. 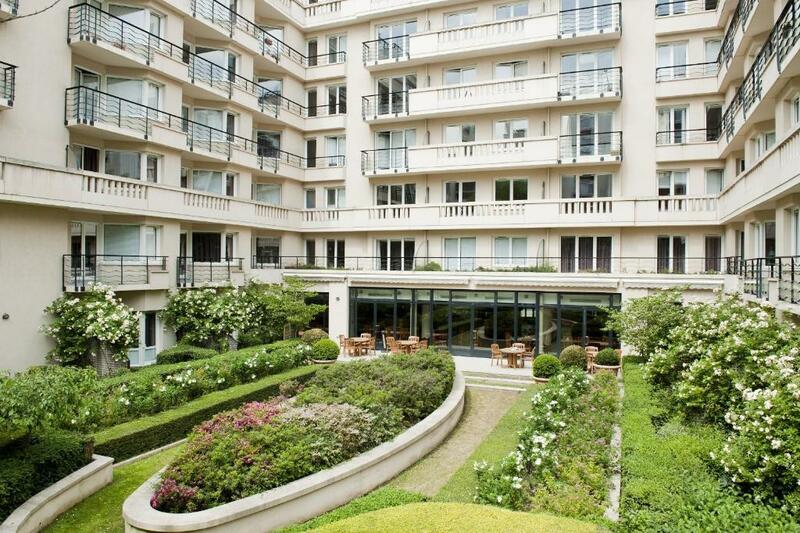 One of our top picks in Paris.Opposite Porte de Versailles exhibition center, this 4-star eco-friendly residence offers a 24-hour reception and is only 1.9 mi from the Parc des Princes Stadium. Free optic WiFi is available in all areas and extra features include a garden patio. 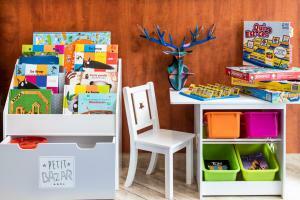 A buffet breakfast is served every morning and children from 4 to 11 years old can enjoy it at a reduced rate. There are also vending machines in the 24-hour reception. Alternatively, meals can be prepared in the accommodations’s fully equipped kitchen, which is complete with hotplates, a microwave, refrigerator and freezer. Private indoor parking is available on site according to availability. 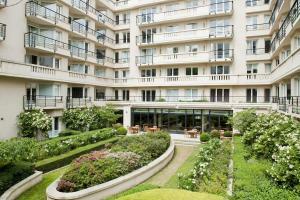 The property is an 8-minute walk from Porte de Versailles tram and Metro station, providing direct access to Montparnasse and Place de la Concorde. Parc des Princes Stadium is only 1.9 mi away while the Boulevard Périphérique is just next to the residence. When would you like to stay at Aparthotel Adagio Porte de Versailles? This elegant accommodations offers a flat-screen TV with satellite channels and an equipped kitchen. The private bathroom features a bath and a hairdryer. This elegant accommodations is composed of 2 rooms and offers a flat-screen TV with satellite channels. Extra features include an equipped kitchen and a seating area. It has a private bathroom with a bath and a hairdryer. This studio features a balcony, kitchenware and microwave. This studio features a kitchenette, tea/coffee maker and electric kettle. This apartment features a stovetop, cable TV and microwave. House Rules Aparthotel Adagio Porte de Versailles takes special requests – add in the next step! Aparthotel Adagio Porte de Versailles accepts these cards and reserves the right to temporarily hold an amount prior to arrival. Breakfast is not included and costs EUR 11. Dated and not very clean. Air vent over the door fell to the floor almost hitting my kids. The toilet was too small for my 8 year old so was not properly usable for us adults. It was meant to be a family room. The sofa bed wasn’t very suitable should have been abit more comfortable as kids were sleeping on it. The place was nicely clean. The kitchen and setting of room eas good. We had booked an early check in which we did not get and the staff that first day were not very polite, pleasant or helpful. Eventually he managed to get the 16 of us into 1 of our apartments so we could get ready as we had lunch reservations then were out all day so couldn’t check into the other rooms until we came back around 10pm. Also there was a lot of renovation work being done in the hotel which detracted from the experience. The apartments were laid out really well. We had 3 apartments between the 16 of us. Each apartment had 2 showers and the toilet was separate which helped when we were trying to get ready. Breakfast was amazing. Rooms were low level. Furniture dirty. Water in showers was brown. The receptionist was kinda rude and not helpful at all. We arrived at 10, so we had to wait till 15 to enter the room, OK, this is normal, but at 15 we still had to wait for quite long time because she did not check us in yet even if our car was already in the parking and our arrival was announced since 10. The light in the wc was flickering very badly so we asked her if it can be replaced. She responded ironically and of course did nothing. Very comfortable and practical especially when you don't have time to go out for dinner or breakfast. Fully equipped kitchen point in the room. Near the Palais du Congrès. Unfortunately the hotel was undergoing renovations when we stayed so immediately upon entering we walked on unfinished cement subflooring past plastic dust drapes and our view from room was of scaffolding. We kept the curtains closed when we were in the room because at one point we opened them and someone was standing outside the window. The kitchen area was REALLY small, not a lot of prep area for cooking. The bathrooms were also not clean. There was dried blood on one of the walls and mold/mildew around the tub. I am not sure if the hot water was on a timer, but during the day after breakfast I was able to wash dishes with hot water. But after a day in the city we were stuck with cold water showers at night. The actual toilet was separate from the sink/tub room. The toilet space was TINY!! There was no central heat control to heat the entire space. There was a space heater provided that took some time, but did heat the space eventually. The heating was not working (and it is winter) so the accomodation was cold. The landline was not working (I couldn't contact the staff). I went to the reception twice to alert the staff. The problem wasn't fixed. I was provided a portable heater, nice but not enough. Work was being done on one side of the building and we weren't warned in advance. The smell bothered me immensely. The night rececionist very polite, gentil and helpful. Only the central heating did not work. They provided an alternate room heater, so it did not matter anyway as the heating was perfect. The location was perfect as it is in secluded street with no disturbance and all the locations are very nearby, I went in a rental car and the parking within the apart-hotel was very comfortable. The apartment with two double bedroom was also perfect for the short stay.